Inspired by the bugged output in @Carcigenicate's Clojure answer for the Print this diamond challenge. There will be no input (or an empty unused input). A single trailing new-line is optional. Leading spaces or new-lines are not allowed. Returning a string-array isn't allowed. You should either output the text, or have a function which returns a single string with correct result. This is code-golf, so shortest answer in bytes wins. Don't let code-golf languages discourage you from posting answers with non-codegolfing languages. Try to come up with an as short as possible answer for 'any' programming language. Standard rules apply for your answer, so you are allowed to use STDIN/STDOUT, functions/method with the proper parameters and return-type, full programs. Your call. If possible, please add a link with a test for your code. Also, please add an explanation if necessary. @Leaky Nun helped golfing this a lot, @Praind Suggested a method to save 1 byte, which I formerly thought of, but forgot to edit, @CotyJohnathanSaxman suggested changing the loop. i=8 - Assigns the value 8 to a variable called i.
exec"..."*17 - Execute that block of code (...) 17 times. print(...) - Output the result.
' '*abs(i) - Create a String with a space repeated |i| times. .join('1234567890') - Interleave the string created above with 1234567890, such that |i| spaces are inserted between the digits. i-=1 - Decrement i, and by executing it 17 times, it reaches -8, which creates te repetitive pattern with the help of abs(). -14 bytes by switching to JDK 11, which now has a native String::repeat. 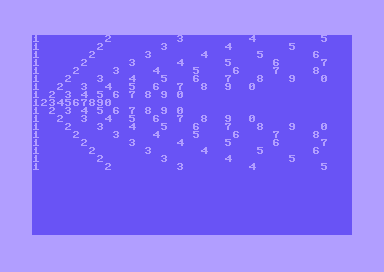 It's all the expected digits, joined by %1$Ns where N is the number of spaces between each digit. %1$Ns basically means "take the first argument and pad it until length is at least N". Also, %1$0s is not supported so a special case %1$s is made for 0. Finally, I format-print that string using a single argument: "", so the formatter reuses always the same empty string, padding it with spaces as needed. Thanks Shaggy for saving 10 bytes. Thanks Craig for saving 1 byte. Thanks arcs for saving 4 bytes. Saved one byte thanks to Leaky Nun. g;?↔z                   Zip that string of spaces with "1234567890"
⟦0¶⟧    A list whose element is the string "0\n"
Note: Cast(1) takes the same number of bytes because "1" would need a separator before ":" (which as it happens the deverbosifier fails to insert). Just pasting and collapsing the strings. Edit: thanks for Challenger5 for pointing out a problem. Fixed it now. Edit 2: saved a byte thanks to bouncyball. 1 byte thanks to Mnemonic. Update : -28 bytes thanks to Leaky Nun ! Update 2 : -43 bytes thanks to Leaky Nun again ! EDIT : The code earlier was wrong ! Made a mistake while golfing the code, it should work as intended now ! This is a full program that prints to STDOUT. Try it online! There are lots of trailing spaces. Husk is still missing lots of essential stuff like a two-argument range function, so parts of this solution are a little hacky. ṁs`:0ḣ9  This part evaluates to the string "1234567890". ḣ9   Range from 1 to 9.
ṁs        Convert each number to string and concatenate. but with 17 elements instead of 5. R8'           A string of 8 spaces. t               tail of the prefix list, palindromizing it. `:                  with respect to flipped prepeding. This prepends each digit to each string of spaces. mΣ                     Map concatenation over the results, computing the rows. Implicitly join with newlines and print. Idea of @Bridge to use just @ for variable name - all these tricks!! -27 by fixing a couple of dumb mistakes. The outer use of a wasn't necessary, so I was able to get rid of a altogether and just write apply str once. That also allowed me to use a function macro for the main function, which saved some bytes. I also inlined the call to Math/abs instead of rebinding n-spaces. Basically a Clojure port of @Mr.Xcoder's Python idea. In retrospect, I should have used the abs/range method for the diamond challenge originally, but I then I may not have produced the bugged output! Pretty simple. Joins the number string with a number of spaces that depends on the current row. Your compiler will probably complain a lot about this code; mine threw 7 warnings of 4 different types. Might improve the code later. It outputs some trailing spaces, which is supposed to be OK. It prints the numbers using left-justified fields of dynamic length - that's what the format string %-*d is for. The inner loop has some funny initialization (starts from 10; any multiple of 10 would be fine) to "simplify" its termination condition. Link to the verbose version. Basically I create the lower part of the drawing and then reflect the text up. A,     e# Get [0 1 2 ... 9]. (+     e# Rotate the 0 to the end. 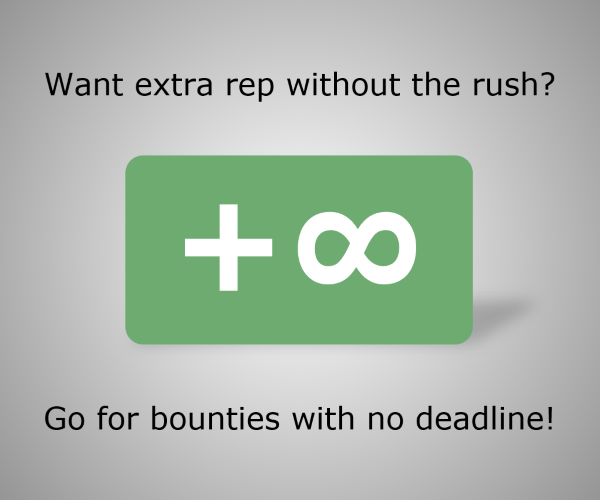 aH*    e# Wrap in an array and repeat 17 times. :\   e#   Unwrap the pair and swap its order. 8-z  e#   Get the absolute difference of the index from 8. S*   e#   Get a string of that many spaces. *    e#   Riffle the list of digits with the string of spaces. n    e#   Print it with a trailing linefeed. Note: First line ends in 9 spaces. Explanation: Uses creative line numbering! The first loop needs to run 9 times and delete a space each time, while the second loop needs to run 8 times and add a space each time. The former is achieved by running it 7 times and falling through for the 8th time, while the latter is achieved by adding two spaces and falling through to delete one of them again. Constructs a range of 8,7,6...2,1,0,1,2...8 then loops through each number. Inside the loop we construct a range of 1..9 concatenated with 0 then -join the numbers in the range together with the appropriate number of spaces. Each string is left on the pipeline, and output is implicit at program completion. Not the answer you're looking for? Browse other questions tagged code-golf ascii-art number kolmogorov-complexity or ask your own question. I done did made a spaceship maw!